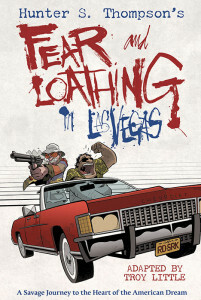 Fear and Loathing in Las Vegas from Top Shelf and IDW is a brand new graphic novel by Eisner-nominated artist Troy Little, who has adapted and illustrated Hunter S. Thompson‘s book of the same name. The hardcover presentation is simply beautiful. It is soft to the touch, until you notice the nearly invisible glossy ink bats flying over our (anti)heroes. I’m a fan of the original book, fond of the audio book, and a connoisseur of Hollywood’s interpretations of said adventures. I’ve also been a Las Vegas resident since 2008, so this book was automatically on my radar. This 170-page graphic novel is nothing short of breathtaking. Little’s cartoony characters and herky-jerky frames and lettering add to the drug-fueled stories contained within. The colors pop on every page, whether you find yourself in a dark, seedy hotel room or the bright outdoors. Dr. Gonzo and “Raoul Duke” morph from super cute caricatures to demonic fiends from panel to panel, page to page. It’s a delightful adaptation that pulls in much more of the original book than a two-hour movie ever could. My favorite panel: When Dr. Gonzo (tripping hard on psychedelics) begs Hunter Thompson to drop the radio into the bathtub he’s in as the song “White Rabbit” peaks and we see Thompson through his eyes: a wild and crazy MAD HATTER holding not a radio, but a psychedelic teapot, with a diseased evil white rabbit snarling in the corner.